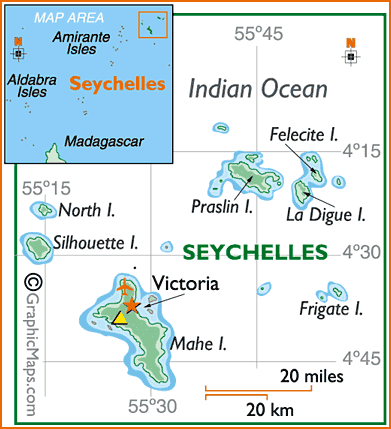 The Seychelles is situated 4 Degrees South of the Equator in the Indian Ocean. Often referred to as the “Jewel of the Indian Ocean”, this Archipelago is probably what could be the definition for Paradise! On the hundred or so islands in the Seychelles, scattered over an area of 400,000 square kilometres of ocean, you can discover primeval mistforests, huge flocks of sea birds and giant tortoises, black parrots and the flightless white-throated rail bird [related to extinct Dodo]. There are old plantation houses,ruins of leper hospitals, pirate graves and legends of buried treasure. Then, of course there are the famous beaches – miles of deserted powdery white sands, surrounded by coral reefs and sparkling lagoons. Praslin the second largest island in the Seychelles,is home to the Vallee de Mai – a primeval rainforest containing the famous coco de mer palms, which have the largest, heaviest and most suggestively shaped nuts in the world. For tropical charm, La Digue has it all – tumble down plantation houses, with dusty roads used by slow – moving bicycles and ox – carts. The beaches of La Digue are supposedly the most photographed in the world, distinguished by the weathered granite boulders that resemble modern art pieces. Many other smaller islands have been turned into discreet hideaways for the rich and famous or nature reserves for the many examples of rare species found nowhere else on earth. Nature under the waves is as spectacular as the many unique species on dry land in the Seychelles . The coral reefs that form around many of the islands contain huge numbers of fish and other species and the corals themselves well worth a closer look. Further out to see from the reefs are much larger fish, Tuna, Sailfish, and a variety of Sharks for those divers who wish to experience the thrill of swimming close to the giants of the deep. The ‘Desroches Drop’ is a site renowned for the best diving in the Seychelles, if the Indian Ocean. Even if you are not a diver, a snorkle on the reefs around the islands is almost as amazing: if the birds are sometimes lacking in colour, the fish make up for it in a vivid living kaleidoscope. Many of the best sites lie in the national marine parks around mahe and Praslin. The tropical climate and colourful culture of the Seychellois people make the this unique group of Islands the ultimate paradise. For a ten or fourteen day itinerary you will be able to include Mahe and Silhouette in the cruise as well as the other islands around Praslin. Silhouette is well named,the impressive mountainous silhouette of the island looms above the ocean, off the coast of the famous Beauvallon Bay in Mahé. “Silhouette the Wild” seems to have been specially created for nature lovers and walking enthusiasts. There are no cars or roads on this island. Instead, rivers and waterfalls populate one of the most beautiful equatorial forests of the Indian Ocean. Silhouette is a paradise for naturalists who will be delighted to discover the exotic and rare trees and plants growing here. Some 300 inhabitants earn their living from coffee, tobacco, cinnamon and avocado plantations. This island is a haven of peace, which should be explored on tiptoes and with eyes wide open. 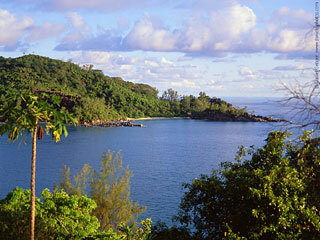 Mahe the main island of Seychelles is undoubtedly one of the most beautiful and impressive in the world. Each of its 70 beaches has a different character; the rock formations behind them are a dramatic contrast and a beautiful backdrop for the architectural elegance of the hotels. The highest point is Morne Seychellois 900 meters above sea level, a great place for hiking. The airport is south of Victoria and built on reclaimed land, offering stunning views of the verdant island and its coastline. Victoria is the capital with a population of some 20,000 spread around a large bay at the foot of Morne Seychellois and the Trois Freres. This tiny city is the islands economic and administrative hub as well as their only port. While no one street is best for souvenir shopping there are a cluster of shops and boutiques around the clock tower. St Anne Marine National Park now protects over 150 types of fish, there is a fee to enter the marine parks again this money goes towards to protecting and conserving the wild life. There are over 20 dive and snorkel sites in the marine parks around Mahe. These dive sites, primarily of granite rock in origin are heavily encrusted by rich marine growth and populated by the many colorful fish and invertebrate species of the Indian Ocean. The islands oceanic isolation has accounted for many indigenous species unique to Seychelles waters, such as the Seychelles anemone fish. Although the soft corals are much smaller and more of a dwarf variation of those found in the Red Sea or Malaysia, they are very brightly colored and are home to some amazing forms of marine life. The National Parks are active in nature conservation, to ensure they can protect and conserve these areas there is fee per person to visit these areas from $10-$20 per person. Excusions are not part of your all inclusive vacation, and these fees need to be paid by each person, when visiting the marine parks. Air Seychelles flies to Paradise on Earth several times a week, leaving from the airports of Frankfurt, London, Milan, Paris, Rome and Zurich in Europe, and also from Dubai, Johannesburg, Mauritius, Nairobi, Reunion and Singapore. The Seychelles, a group of over one hundred islands in the Indian Ocean, is a haven of unspoiled nature just waiting to be discovered. In addition to Creole, both English and French are spoken here. The temperature in the Seychelles does not vary much, the average is 26-29°C throughout the year, accompanied by a very pleasant breeze. The islands lie outside the hurricane belt, and violent storms are very rare. 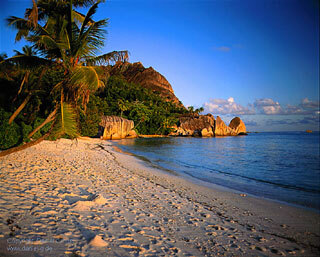 The Seychelles can therefore be visited at any time of the year. Even though tropical rains fall more frequently in January and February, the weather can be completely different from one side of an island to the other; the sun will probably be shining only a few miles away. The weather in the Seychelles is tropical and humid. From May to October, the wind blows regularly from south to east, bringing a dryer climate and slightly cooler temperature. From December to March, it is the southern summer with north-west winds and a more humid climate. However, the weather is pleasant in all seasons, never too cool or too hot. The averagesea temperature is from 27° to 29° perfect for all water sports. The delicious Creole cuisine is based on fish and a wide variety of exotic vegetables, fresh fruit and spices that simply must be sampled when you are in the Seychelles. The delicious Creole cuisine is based on fish and a wide variety of exotic vegetables, fresh fruit and spices that simply must be sampled when you are in the Seychelles. Food is plentiful if eating local produce, due to the remote location of the islands only local produce is available. The official currency is the Seychelles Rupee. MasterCard and Visa credit cards are widely accepted. You can also withdraw money from cash distributors on the larger islands. Most consumption goods have to be imported, which explains why shopping can be fairly expensive in the Seychelles. While local crafts, exotic fruits and flowers are plentiful and very reasonably priced. Foreign Currency is needed to spent in the Seychelles please travel with Euros, US Dollars or GB Pounds. Time difference: The Seychelles is four hours ahead of Universal Time. The time difference with France and Western Europe is therefore only + 2 hours in summer and + 3 hours in winter. Electricity: 220 volts AC, 50 Hz. Plugs are of the English type, square with three points. While on the yacht the electricity is 110 Volts and plugs are the American two pin. Upon arrival at Mahe, allow up to 1 ¼ hours to clear customs, and collect luggage. To fly on to Praslin, you will need to go to the domestic departure lounge. Leave the international lounge and walk out of the airport, turn right, pass the check in desks and bar, following signs for domestic flights [200 yards away]. Pick your tickets up from the ticket office and check bags through. Then enter the waiting lounge, the planes are small and only take 10-20 people. The Shuttle flights to Praslin depart every 30 minutes and cost approximately $75 return flight. The planes only carry 10-20 people at a time so you need to book this flight early, to ensure a smooth connection. We can help with booking flights and suggesting routes. There is a fee to enter the National Marine Parks, they charge from $12 – $25 per person, to go ashore and visit the islands in the Parks . This money helps the local government to protect and restore their beautiful islands. The National Parks are active in nature conservation, the fees ensure they can protect and conserve these areas. Excursions are not part of your all inclusive vacation, and these fees need to be paid by each person, when visiting the marine parks. Foreign Currency must be used to enter the national parks, either US dollars, GB Pounds or Euros. You are encourage to bring foreign currency in to the Seychelles Islands, please do not change all your money in to Rupees- be advised by the Base Manager upon arrival where and when you will need Rupees. There is a $40 fee for departure tax per person, due in dollars, imposed upon visitors to the Seychelles by the local government. Don’t leave Praslin without visiting Vallée de mai, a valley protected by UNESCO home of rare species of trees and particularly the famous coco de mer, a unique palm tree. A walk in the Vallée de mai is enchanting. The path wanders in the near obscurity created by enormous palm leaves of the cocos de mer. The trunks are 40 m high and sway gently in the breeze, making a strange rustling sound as they rub against one another. Wherever you look the foliage seems to go on and on as the path winds up through dark, damp clefts before coming out onto the ridge where there are magnificent views over a dense sea of green. Anchorage in Petite or Grande Anse, South East of the island. Rent a bike to visit this beautiful island never overrun with tourists, thanks to the lack of accommodation. With its white tracks winding under tall palm trees, houses with roofs of palm leaves, small copra factories, fine white sand beaches and large polished rocks, La Digue might be the most beautiful island in the Seychelles. No cars, only bicycles or carts drawn by oxen. Horse rides are also possible. Sail around Marianne and Félicité. Anchorage on the west coast of Grande Sœur for lunch. Unforgettable snorkelling at Cocos Islands. Made of large rocks with strange regular stripes carved by the sea, Cocos Island forms a beautiful sight with a great harmony of shapes and colours. The ochre colour of the rocks is in contrast with the bright green palms of the coconut trees and the white sand of beaches lined with deep turquoise water. Under the sea, the vision is equally attractive with large arbores cent corals where thousands of many coloured fish swim in front of narrow breaks and dark caverns. Go to Curieuse and anchor for the night in Baie Laraie, east coast, or go back to Baie Sainte Anne if you need water. Curieuse, part of the Marine National Park is the home to a hundred or so giant turtles, you cannot miss them. 45mn walk, into mangrove and “coco fesse” trees, leads you to the other side of the island, where is a nice beach and small but interesting museum. Sail to St Pierre islet, a mass of rounded rocks crowned with a clump of tall palms swaying gently in the wind: typical and superb scenery of the Seychelles photographed on countless occasions and printed a million times in tourism magazines! Excellent spot for snorkelling with magnificent underwater scenery. Go back to Baie Laraie for the night. Aride Island, placed under the supervision of the Royal Society for Nature Conservation, is a conservation area. Narrow paths through the dense vegetation leads to the rocky barrier in the north from where the whole island can be observed. Free of cats and rats, which have ravaged so many tropical islands in the worlds, Aride is a haven for a wide variety of seabirds, unique vegetation and rare land birds. The ten species of breeding seabird include the rare roseate tern and the red tailed tropicbird. The world’s largest colony of lesser noddy, more than 200,000 couples nest there. Open on Mondays, Wednesdays and Sundays. Back to Baie Laraie for the night. Cousin Island is a nature reserve and bird sanctuary with rare species and some giant turtles. Less than 800 meters in diameter, the island can be visited from Tuesday to Friday. A small path leads to the turtles’ enclosure from where it leads to the summit through dense vegetation. Great panorama and good spot from which to observe the gracious flights of tropicbirds. During the season of southeasterly winds, there may be up to 100,000 couples of black noodies nesting in the trees. Go back to Baie Sainte Anne for the night. Check in at the base at 09.00 am. Visit of the Vallée de mai, a valley protected by UNESCO. A walk in the Vallée de mai is enchanting. The path wanders in the near obscurity created by enormous palm leaves of the cocos de mer. The trunks are 40 m high and sway gently in the breeze, making a strange rustling sound as they rub against each other. Wherever you look, the foliage seems to go on and on as the path winds up through dark, damp clefts before coming out onto the ridge with magnificent views over a dense sea of green. Night anchorage in Bay Ste Anne. Sail to St Pierre islet, a mass of rounded rocks crowned with a clump of tall palms swaying gently in the wind: typical and superb scenery of the Seychelles photographed on countless occasions and printed a million times in tourism magazines! Excellent spot for snorkeling with magnificent underwater scenery. Sail to Curieuse and stop in Anse san José. Part of the Marine National Park Curieuse. 45mn walk, into mangrove and “coco fesse” trees, leads you to the other side of the island, home of hundred or so giant turtles, you cannot miss them. Cousin Island is a nature reserve and bird sanctuary with rare species and some giant turtles. Less than 800 meters in diameter, the island can be visited on Tuesdays, Wednesdays, Thursdays and Fridays. A small path leads to the turtles’ enclosure from where it leads to the summit through dense vegetation. Great panorama and good spot from which to observe the gracious flights of tropicbirds. During the season of southeasterly winds, there may be up to 100,000 couples of black boodies nesting in the trees. Anchorage for the night in Anse Lazio, the most comfortable mooring in Praslin and may be the most beautiful beach in the Seychelles. Day 4: Anse Lazio – La Digue. Rent a bike to visit this beautiful island never overrun with tourists, thanks to the lack of accommodation. With its white tracks winding under tall palm trees, houses with roofs of palm leaves, small copra factories, fine white sand beaches and large polished rocks, La Digue might be the most beautiful island in the Seychelles. No cars, only bicycles or carts drawn by oxen. Horse rides are also possible. Anchor outside the harbor. Sail around Marianne and Félicité. Mooring buoys west of Cocos Islands. Made of large rocks with strange regular stripes carved by the sea, Cocos Island forms a beautiful sight with a great harmony of shapes and colours. The ochre color of the rocks is in contrast with the bright green palms of the coconut trees and the white sand of beaches lined with deep turquoise water. Under the sea, the vision is equally attractive with large arbores cent corals where thousands of many coloured fish swim in front of narrow breaks and dark caverns. Unforgettable snorkeling. Go back to La Digue for the night. Anchor west of Grande Sœur. Visit of the island made of two steep and rocky hillocks, linked together by a low isthmus. A small coconut plantation hiding some shacks covers the sandy plateau. The contrast made by the bare rocky part and the undergrowth of the coconut grove is beautiful. Great snorkeling on the west coast where you can see marine turtles. Nice beaches on the east coast. Open from Monday to Friday. Go back to Baie Sainte Anne for the night. Back to the base at 12 noon. A-Yacht Charter is a Caribbean Yacht Charter company. Our main offerings include: Mediterranean Yacht Charters and Florida Boat Charters for your personal vacation or business event needs.